Promotions and contests can be an effective way to drive buzz in social media, but do they drive tangible value? The answer to that lies in ensuring you have clearly defined goals prior to launching a promotion, and ensuring the promotion collateral enables users to convert on those goals. When deciding what you want to get out of any given promotion, it is important to keep this in mind: social media sites are not the correct platforms for hard selling your consumers. Create goals that are realistic for the platform and appeal to your target demographic. 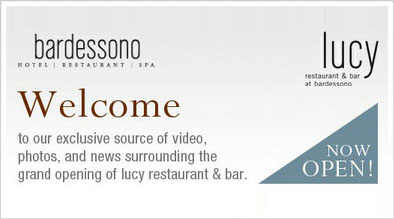 Bardessono Hotel is a luxury boutique hotel and spa in California’s famous Napa Valley. The property recently revamped their on-site restaurant, Lucy Restaurant & Bar, focusing on high quality food and wine with an emphasis on locally sourced ingredients, under the tutelage of Chef Victor Scargle. The goals of the promotion was to increase awareness about the restaurant, educate consumers about the quality of the locally sourced foods and encourage interaction between the hotel and consumers. To achieve these goals, a custom application dedicated to the restaurant was created and added to the hotel Facebook page. 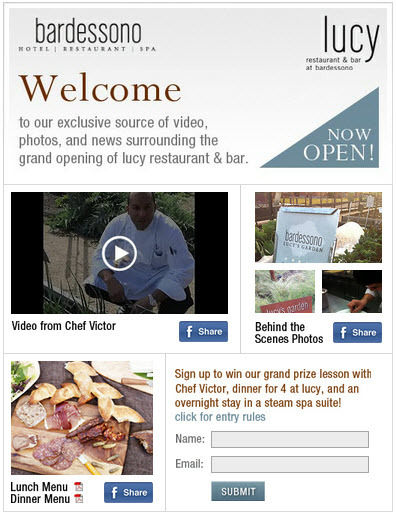 The application included exclusive videos from Chef Victor, behind-the-scenes photos of the restaurant and gardens, sample lunch and dinner menus, and the opportunity to win a private cooking class with Chef Victor, dinner for four at Lucy, and an overnight stay in a spa steam suite. The increase in fan involvement and engagement on Facebook is quite clear, and those fans showed an obvious extended interest in the restaurant by actively downloading and viewing the photos, videos and menus. The most interesting stat from the results however is the final point: the 49% increase in visits directly to the restaurant page, NOT counting traffic from Facebook. This means that the promotion created enough buzz about the restaurant that it drove a significant spike in user interest to the point that users were specifically searching for the restaurant from search engines. The value of any one promotion has to be uniquely tailored to the needs of your brand. By targeting the right kinds of social media users, you can make sure you are building a fan base of potential customers rather than just building numbers. A Like is just a Like, but a fan who has actual interest in the services you provide is somebody with significant value as a potential customer and a brand advocate. I just started a contest for one of my clients to increase the awareness of their product. Based on your article here, I think what I did puts me on the right track!